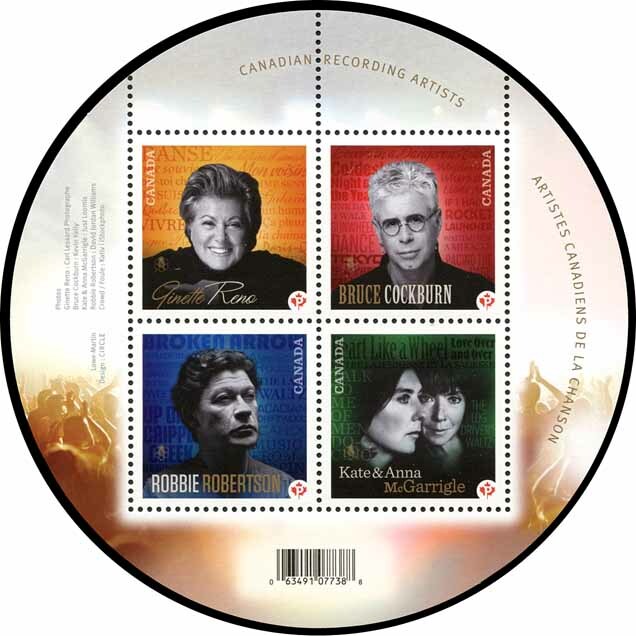 On June 30th, 2011, Canada Post will begin issuing another series of stamps celebrating Canadian recording artists. This is the third installment of the series which began in 2007. This year the four honorees are : The McGarrigle Sisters, Bruce Cockburn, Robbie Robertson and Ginette Reno. Kate and Anna McGarrigle were raised in St-Sauveur-des-Monts, Quebec, and started playing music at a young age. During their illustrious career, they also collaborated with many other famous artists such as Emmylou Harris, Gilles Vigneault and Joan Baez. They produced music for film and television, including a musical piece for the fantasy movie ‘Tommy Tricker and the Stamp Traveller’. The musical legacy continues within the family ; Kate McGarrigle’s children, Rufus and Martha Wainwright are well known musicians in their own right. Although she knew of the plan for the stamp, in 2010 Kate McGarrigle lost her battle to clear-cell sarcoma, a rare form of cancer, before the official unveiling by Canada Post. The sisters were members of the Order of Canada and had also received the Governor General’s Performing Arts Award. Bruce Cockburn was born in Ottawa, Ontario and was interested in music at an early age. His high school yearbook comment simply states the wish ‘to become a musician’. One could say his dream came true. From the boy who used to play a guitar found in his grandmother’s attic, Bruce is well known today as a singer-songwriter of the first order. His music seeks to promote awareness and reform ; songs such as ‘If I Had a Rocket Launcher’ are an example of this. Mr. Cockburn is also an Officer of the Order of Canada. Robbie Robertson was born in Toronto, Ontario. His mother is of native american descent and he learned to play the guitar during his summer visits to the reservation. His big break came when Bob Dylan asked him to play backup during one of his tours. Robbie quickly established his own style. As well as being in several bands throughout the years, he had a successful solo career with hits such as ‘Somewhere Down the Crazy River’, ‘Showdown At Big Sky’ and ‘Broken Arrow’. He has also produced music for famous films such as Raging Bull, The Color of Money and Shutter Island. Robbie was inducted into Canada’s Walk of Fame and was given the Royal Order of Canada. Ginette Reno is a Quebec legend. Born Ginette Raynault in Montreal, she loved music at a young age. She would sing in stores in the Plateau Mont-Royal district of Montreal. After entering a singing contest at the age of 13, her life changed. Ginette won first prize, acquired a manager, got a name change, and was on her way to stardom. Her first hit at the age of 15 was ‘J’aime Guy’. Her mature and powerful vocals meant that there was no stopping her. An international performer, Ginette Reno is regarded as one of the best singers in the world and many stars have been inspired by her. Ginette was the youngest artist to be made an Officer of the Order of Canada. She also has a star on Canada’s Walk of Fame and innumerous trophies and awards.